NEW YORK, March 13, 2019 –Given that 10 states allow the sale of recreational marijuana, U.S. auto insurers are examining how the drug is impacting motorist behavior and claims-filing patterns, according to a new Insurance Information Institute (I.I.I.) white paper. A Rocky Road So Far: Recreational Marijuana and Impaired Driving explores marijuana impairment’s impact on a motorist’s driving abilities, how states deal with marijuana-impaired motorists, and marijuana’s broader implications for U.S. roadway safety. Early results aren’t promising, the I.I.I. found. There are signs legalizing recreational marijuana pushes accident rates higher, while it can be difficult to detect whether a driver is high on marijuana. “There is currently no ‘breathalyzer’ equivalent for marijuana impairment,” write James Lynch, the I.I.I.’s Chief Actuary, and Lucian McMahon, the I.I.I.’s Senior Research Specialist, the white paper’s co-authors, referring to the device which detects alcohol-impaired motorists. 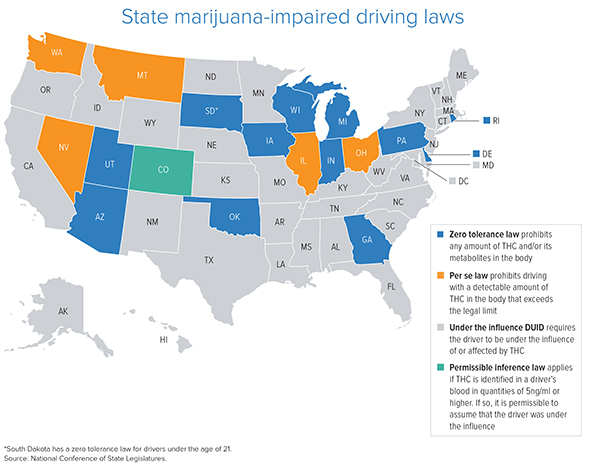 Some U.S. states hold that a motorist is driving while marijuana-impaired if the THC concentration detected in their bodies exceeds a certain limit, such as 5 nanograms per milliliter (ng/ml). THC is the main psychoactive compound found in marijuana. Other states prohibit altogether motorists from driving with any trace of THC in their bodies. “Early evidence suggests that recreational marijuana legalization is associated with an increase in traffic accidents,” the paper states, citing a 2018 Highway Loss Data Institute (HLDI) study and police-reported crashes in states with legal recreational marijuana. 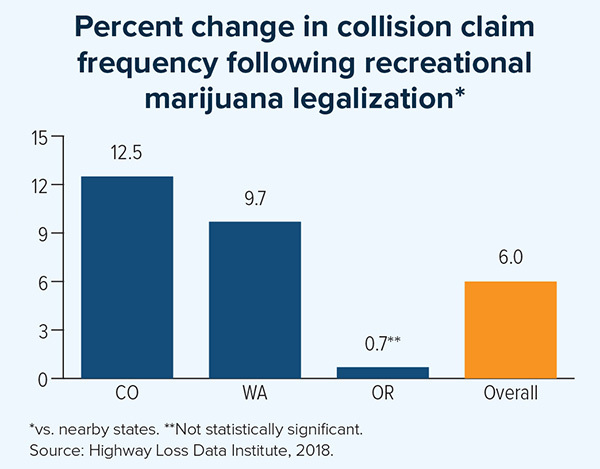 HLDI found collision claim frequency was significantly higher in Colorado (+12.5 percent) and Washington (+9.7 percent) than in nearby states without recreational marijuana, although the increase in Oregon (+1 percent), the other state the HLDI study covered, was deemed statistically insignificant. 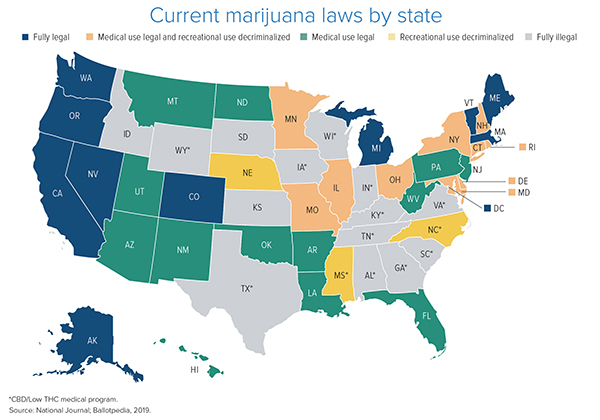 In addition to those three states, recreational marijuana is legal in seven others—Alaska, California, Maine, Massachusetts, Michigan, Nevada, and Vermont—as well as the District of Columbia. Moreover, when a motorist consumes both alcohol and marijuana, and then drives, that motorist is 25 times more likely than a sober one to be involved in a fatal accident, the I.I.I.’s white paper notes, pointing to a 2017 study in Injury Epidemiology. Marijuana affects its users differently but the drug generally impairs cognitive and motor skills. Marijuana impairment increases the risk of culpability for a car crash. And mixing marijuana and alcohol heightens driving risks. Marijuana use could increase after recreational marijuana legalization — and the number of THC-positive drivers could increase, as well. Recreational marijuana legalization is associated with an increase in collision claim frequency, according to the Highway Loss Data Institute (HLDI).